Several Brooklyn members of the NYS Legislature will be joined by the Senior Advisor to US Senator Kirsten Gillibrand. More than 2,000 women who work in New York’s non-profit human services sector signed an open letter to Gov. Andrew M. Cuomo last week seeking a living wage. Longtime CEO will leave Aspire of WNY in late July. Even after a five year plan to add 50 elevators to subway stations, more than half the system’s stations will not accommodate people with disabilities. These awards are part of $204 MILLION in funding to strengthen and preserve access to high-quality healthcare announced by governor Cuomo. Accessibility is about more than convenience. 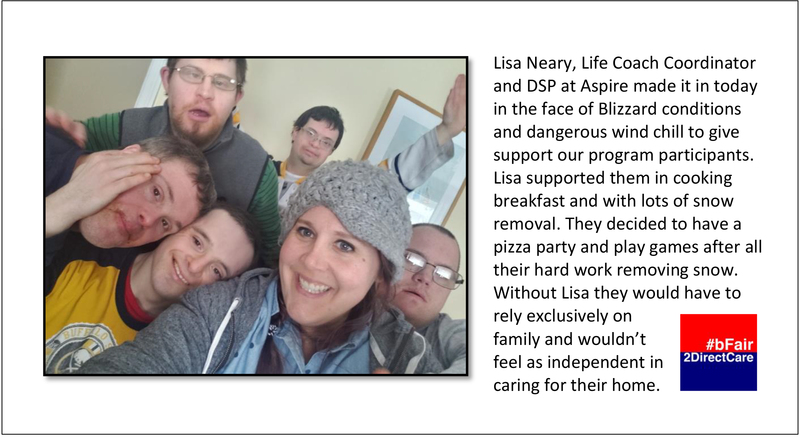 This short video beautifully illustrates why #bFair2DirectCare is asking Governor Cuomo and the NYS Legislature to provide money to fully fund a living wage for Direct Support Professionals and other low-wage workers in our field. Since twice speaking at our Annual Conference a few years ago, sportscaster Jason Benetti’s career has taken off. He is the TV play-by-play announcer for the Chicago White Sox and he has also worked dozen’s of network TV college football and basketball games. Now he has a podcast series that uses humor to raise awreness about the abilities of people with disabilities.